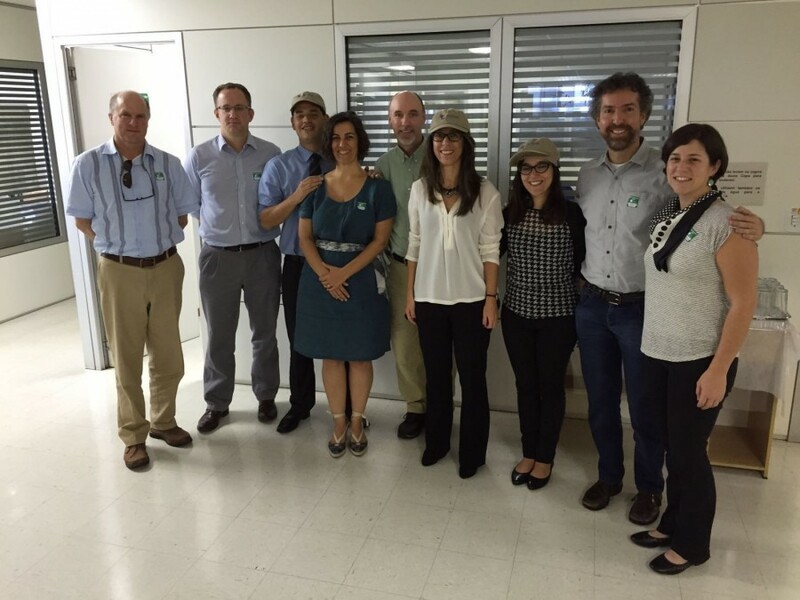 Manomet’s Habitats for Shorebirds staff accompanied by the WHSRN Director, together with staff from our partner organization, SAVE Brasil, were invited to meet with representatives from the Brazilian Ministry of the Environment in the capital city, Brasilia. During the meeting we highlighted Brazil’s key role for supporting shorebird populations of the Atlantic Flyway and discussed opportunities for collaboration between the Atlantic Flyway Shorebird Initiative and the Brazilian Migratory Shorebird Conservation Plan. Members of the Brazilian Ministry of the Environment meeting with us about the significance of Brazil for long-distance migratory shorebirds. The Brazilian government officials reiterated Brazil’s commitment to the conservation of migratory species and their willingness to collaborate with flyway-scale approaches to conserving shared species. We ended the meeting by giving the officials Manomet hats, which they wore with pride in the photo above. We then left Brasilia and headed to our second workshop on the northeast coast in the state of Ceará. 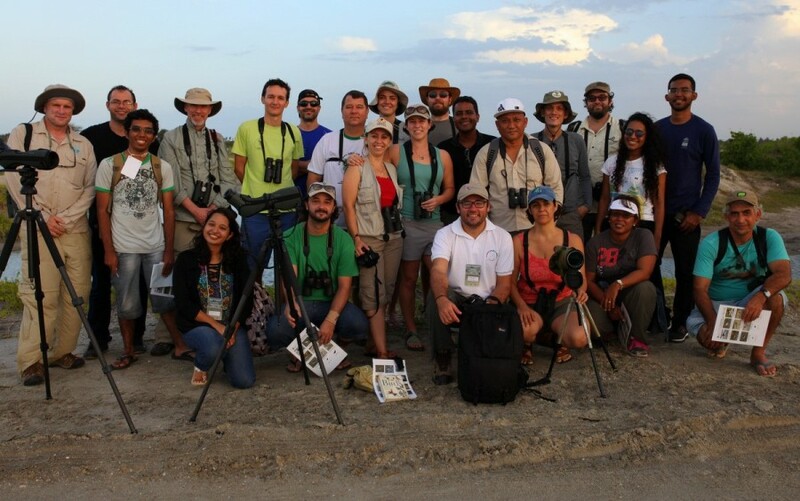 Workshop participants gathered for this photo near the proposed Western Hemisphere Shorebird Reserve Network site, Banco dos Cajuais. Our second shorebird workshop is being held close to the town of Icapui, Brazil, about 300 miles south of the Equator. 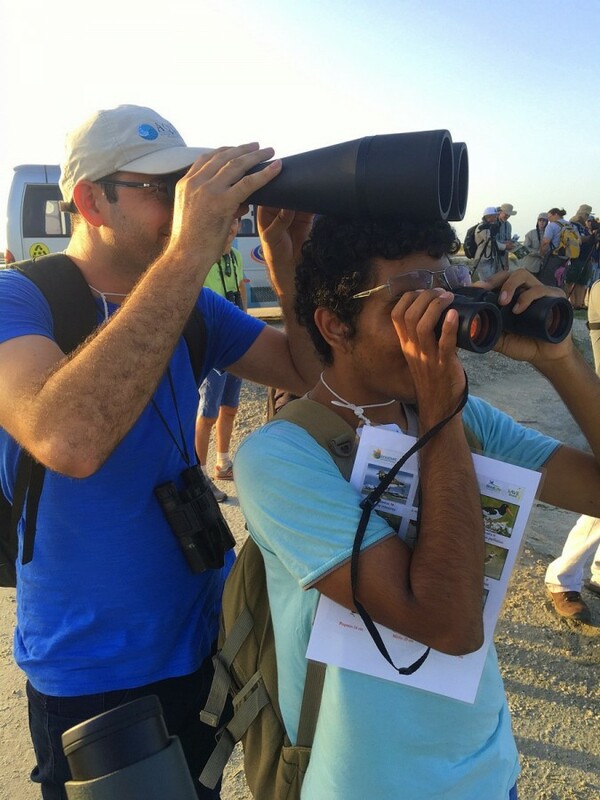 We are conducting a workshop to bring professional managers and biologists together from Brazil, Suriname, and French Guiana, with the intent to build a collective understanding of regional shorebird conservation needs, and develop the strategies needed to alleviate threats to our Atlantic Flyway shorebird populations. Workshop participants were very engaged with the workshop presentations, and we learned a great deal from each other about the challenges and strategies on managing for shorebirds in northern Brazil. We had good informative views of 16 species of shorebirds in Banco dos Cajuais, including a flock of Red Knots with a few individuals banded in Canada, Brazil, and the United States. Students and professionals joined in a friendly, competitive afternoon of species identification and counting, assisted by handy laminated ID cards designed by Manomet and printed by SAVE Brasil. 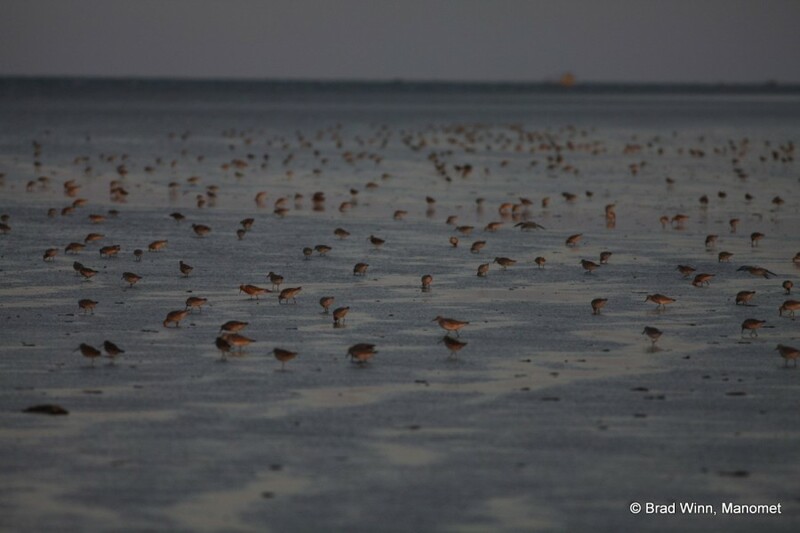 Red Knots and Short-billed Dowitchers follow the quickly receding tide at Banco dos Cajuais, a proposed WHSRN site in Northeastern Brazil. 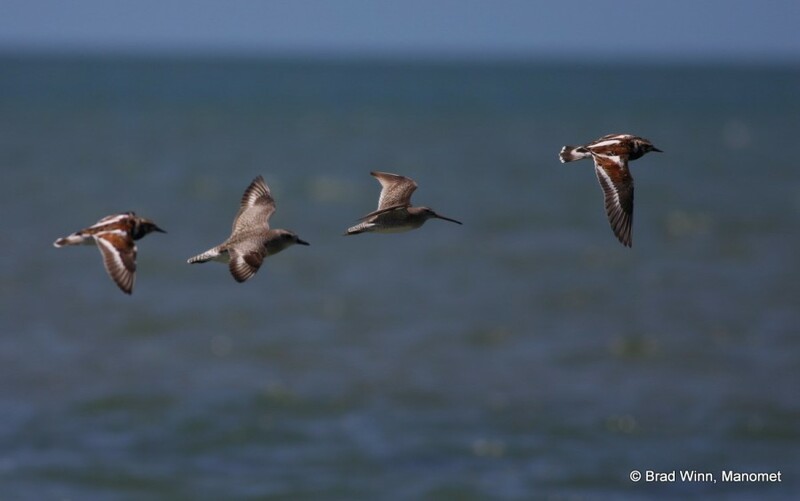 Red Knots seek similar habitat all along the Atlantic, from Bahia Lomas in far southern Chile, to Monomoy National Wildlife Refuge in Massachusetts, USA. Intertidal flats like this, covered by water for some part of each day, are critical for maintaining knot populations in this flyway. Banco dos Cajuais is an extensive area of tidal mudflats, salt flats, mangroves and coastal scrub which holds important numbers of wintering and migrating Red Knot and Short-billed Dowitcher. 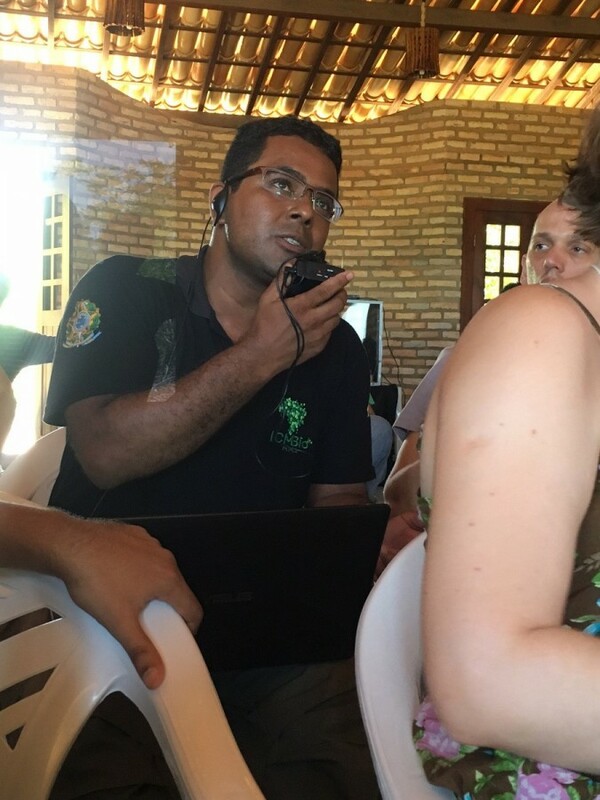 Once designated, Banco dos Cajuais will be the third WHSRN site in Brazil, the others being Lagoa do Peixe (site of the first workshop) and Reentrâncias Maranhenses (the state-protected area manager from here is one of the participants in the current workshop). WHSRN designation will help support the creation of a marine protected area in eastern Ceará state, including the Banco dos Cajuais. Cooperative human tripod: Students learning to identify shorebirds at our workshop at Icapui. Who says learning can’t be fun. Framed by two Ruddy Turnstones, a Short-billed Dowitcher (center right) and a Black-bellied Plover cruise the shore, waiting for the tide to drop from the impressive sandbank flats at Banco dos Cajuais. Gostei mt das imagens e das postagens sobre as ações de pesquisas e estudos s as aves migratórias.As fotos estão mt legais!